Add layers to make your bouquet unique. Bridal bouquets become unique by adding a special element to reflect your individual personality. 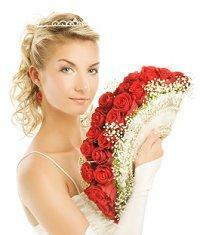 A bridal bouquet that is different from other wedding bouquets is an instant attention grabber. Some unique and wonderful bridal bouquet ideas can help you create that special look that is all yours. Adding crystals or jewels to make a beaded wedding bouquet; This usually works best with a simple wedding dress. The crystal cascade bridal bouquet is a unique idea that uses a traditional full flowering bouquet. The flowers extend outward and downward to create the effect of a waterfall or cascade. Intermixed crystals shimmer in the flowers, and are usually attached with glue or ribbons. This can work with any color of flowers, and other arrangements can also be incorporated into the bouquet. The crystal cascade bouquet can be small or large, depending on your personal preferences. It's a good idea to use a small bouquet with a short wedding dress, or use a large bouquet if you have a long bridal gown train. The toss bouquet and bouquets for the bridesmaids can either be made of a slightly different style or they can be smaller versions of the original. The pomander, or kissing ball, is an especially unique bouquet which is actually a ball of flowers that hangs off the wrist of the bride by a tie of ribbon or lace. Large flowers with numerous petals are the best choice to use with the pomander, but the floral balls can be any size that you desire. The pomander is often used in traditional style European weddings and brings a hint of the Renaissance into the ceremony. 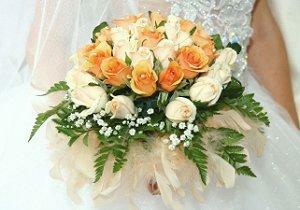 Matching the flowers with the theme is a great way to have an unforgettable bouquet. For instance, if you have a Hawaii or beach themed wedding, try adding some exotic flowers that bring a tropical flair to the ceremony. A fan bouquet is perfect for summer. You will need flowers that are in season and that bring out the colors and emotions of the time of the year. You want everything to flow together beautifully. Coordinated attire is the most appealing. Heat, humidity, and wind can affect your bouquet. Elaborate bouquets are best reserved for formal weddings. You might find unique bridal bouquets that you fall in love with, but don't be afraid to experiment on your own. You might even create an idea that is better than any of the others. You can make your own bridal bouquet something entirely unique just by using your imagination and creative intuition. It's your wedding, so make the bouquet exactly how you want it. The decision to be unique will be a blessing that will separate your wedding from all the others.